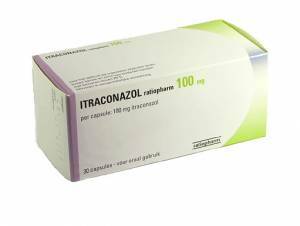 Itraconazole is an antifungal medicine. The active ingredient itraconazole works by weakening the cell membranes of various fungi and yeasts. These cell membranes are vital for their survival. Itraconazole treats fungal and yeast infections from the inside out: the medicine is absorbed in the bloodstream via the intestines and deposited in the affected tissues. Itraconazole is a prescription-only medicine. Fungal or yeast infection of the internal organs. Itraconazole has a long-lasting effect, because it remains in the body for an extended period of time. Itraconazole capsules should be swallowed whole with plenty of water. You can also break the capsules and disperse them in a spoonful of applesauce, for example, if you have difficulty swallowing. It is best to take this medicine with or directly after meals. Always finish the entire course, even if the symptoms have improved. Strength, daily dose and duration of treatment should be determined by a doctor depending on your symptoms. Length of treatment may vary from several days to months. one to two 100-mg capsules once to twice a day for as long as the doctor prescribes. Itraconazole capsules are not suitable for use in children. The doctor may prescribe an adjusted dose of Itraconazole in liquid form (Sporanox) for children. Do not exceed the recommended dose and read the package leaflet closely before use. Consult a doctor if the side effects are persistent or severe. For a complete list of possible side effects, see the package leaflet. You are allergic to itraconazole or any other ingredient in this medicine. If you have health problems, consult a doctor before taking this medicine. Itraconazole may not be used in combination with certain medicines. The doctor will have a list of medicines that you should avoid mixing it with. It is therefore important that you tell the doctor what other medicines or nutritional supplements you are currently taking when you order. Itraconazole should not be used by women who are pregnant or planning to conceive without consulting a doctor first. Do not to take this medicine if you are breastfeeding unless your doctor tells you to do so. In principle, Itraconazole does not affect your ability to drive. In rare cases it may cause dizziness. Stay out of traffic if you experience this side effect. Limit or stop drinking alcohol while taking this medicine as this is likely to trigger or worsen side effects such as dizziness.